From left, Pct. 4 Commissioner Joseph Palacios, Hidalgo County Judge Ramon Garcia, Pct. 2 Commissioner Eduardo "Eddie" Cantu, and Pct. 1 Commissioner David Fuentes. EDINBURG — Hidalgo County commissioners reduced the tax rate Tuesday for the first time in 18 years. The rate has been 59 cents per $100 valuation since 2002, but that will change next year when the rate drops to 58 cents. The last time the county cut the tax rate, however, happened in 1999. The one-cent reduction means the county will forgo about $3.4 million in taxable revenue, Hidalgo County Judge Ramon Garcia said. The cut comes amid preparations to build a new $141 million courthouse. Critics were especially concerned the new project would lead to a higher tax rate, but commissioners, who were adamant it wouldn’t, appeared to quell those fears Tuesday. Employees did not receive a cost-of-living adjustment this year, which further complicated the budgeting of a hefty raise to the county’s chief employee, Valde Guerra. Guerra, the county executive officer, was in line to receive an almost $30,000 raise, which would have brought his yearly salary to $160,000. 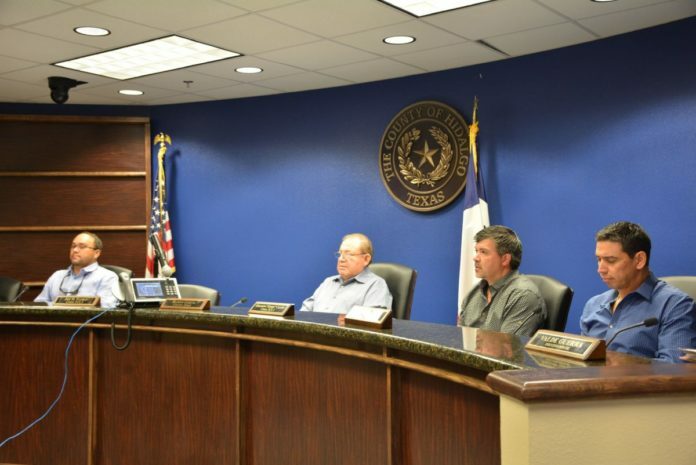 The proposed adjustment, however, appeared to take some commissioners by surprise. “I can’t recall one budget cycle where we talked about it,” Precinct 4 Commissioner Joseph Palacios said Tuesday. “I’ll take the blame or credit or whatever for that,” Precinct 2 Commissioner Eddie Cantu replied. Cantu went on to explain he had asked the budget office to research the salaries for similar positions in counties of similar sizes. Guerra and a few other employees have — so far — not been included in the county’s implementation of the step and grade system, which will go into effect next year. Step and grade is an attempt by the commission to implement a platform on which to base employee salaries. When his office researched Guerra’s position at other similar governmental entities, staff realized most salaries ranged between $160,000 and $250,000. Commissioners, however, were not quick to fully endorse the idea, though several expressed that Guerra deserved the pay. Precinct 3 Commissioner Joe Flores suggested the adjustment be cut in half, leaving Guerra at $145,000 per year. “You got to understand that we’re one of the poorest counties in the state,” he said. And commissioners agreed. They voted to cut the proposed hike in half before approving the approximately $200 million general fund budget. Editor’s Note: This story was updated to reflect Hidalgo County last lowered it’s tax rate in 1999.